HG Heads-Up! Be sure that the cream cheese, yogurt, egg whites, and lemon juice are at room temperature. This will help to prevent cracks in your cheesecake. HG Tip! The topping may run down the edges of the cake once the springform is removed. To catch all of that deliciousness, place the pan on a larger plate before removing the springform. Regular cheesecake is tempting. Add a delicious topping of blueberry goo, and it's irresistible! Luckily, thanks to some HG magic, there's no need to resist. Berry nice! Preheat oven to 350 degrees. Spray a 9" springform cake pan with nonstick spray and set aside. To make the cheesecake, first set out all measured ingredients. Combine cream cheese, sugar, and vanilla extract in a large bowl. With an electric mixer set to medium speed, beat until smooth, 1 - 2 minutes. While continuing to beat the mixture, gradually add yogurt, egg whites, lemon juice, flour, and cinnamon. Beat until thoroughly mixed, about 2 minutes. Evenly pour cheesecake mixture into the pan. Bake in the oven until firm, 40 - 45 minutes. Set cheesecake aside and allow to cool completely in the pan. Meanwhile, to make the topping, bring a medium-sized pot to medium-high heat on the stove. Add all topping ingredients. Add 1/2 cup cold water and mix well. Bring mixture to a boil, and then reduce heat to low. Stirring occasionally, simmer until mixture is thick and gooey, 2 - 3 minutes. Remove from heat and let cool completely. 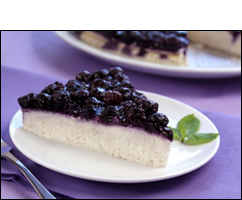 Once cheesecake and topping have completely cooled, evenly pour blueberry topping over the cheesecake in the pan. Refrigerate for at least 1 hour, until fully chilled. Once ready to serve (see HG Tip! ), release and remove the springform. Cut into 8 slices and dig in!